This chapter teaches you how to locate and recognise hard disk devices. This prepares you for the next chapter, where we put partitions on these devices. Data is commonly stored on magnetic or optical disk platters. The platters are rotated (at high speeds). Data is read by heads, which are very close to the surface of the platter, without touching it! The heads are mounted on an arm (sometimes called a comb or a fork). Data is written in concentric circles called tracks. Track zero is (usually) on the outside. The time it takes to position the head over a certain track is called the seek time. Often the platters are stacked on top of each other, hence the set of tracks accessible at a certain position of the comb forms a cylinder. Tracks are divided into 512 byte sectors, with more unused space (gap) between the sectors on the outside of the platter. When you break down the advertised access time of a hard drive, you will notice that most of that time is taken by movement of the heads (about 65%) and rotational latency (about 30%). Actually, the title should be ata or scsi, since ide is an ata compatible device. Most desktops use ata devices, most servers use scsi. An ata controller allows two devices per bus, one master and one slave. Unless your controller and devices support cable select, you have to set this manually with jumpers. With the introduction of sata (serial ata), the original ata was renamed to parallel ata. Optical drives often use atapi, which is an ATA interface using the SCSI communication protocol. A scsi controller allows more than two devices. When using SCSI (small computer system interface), each device gets a unique scsi id. The scsi controller also needs a scsi id, do not use this id for a scsi-attached device. Older 8-bit SCSI is now called narrow, whereas 16-bit is wide. When the bus speeds was doubled to 10Mhz, this was known as fast SCSI. Doubling to 20Mhz made it ultra SCSI. Take a look at http://en.wikipedia.org/wiki/SCSI for more SCSI standards. Random access hard disk devices have an abstraction layer called block device to enable formatting in fixed-size (usually 512 bytes) blocks. Blocks can be accessed independent of access to other blocks. A block device has the letter b to denote the file type in the output of ls -l.
Note that a character device is a constant stream of characters, being denoted by a c in ls -l. Note also that the ISO 9660 standard for cdrom uses a 2048 byte block size. 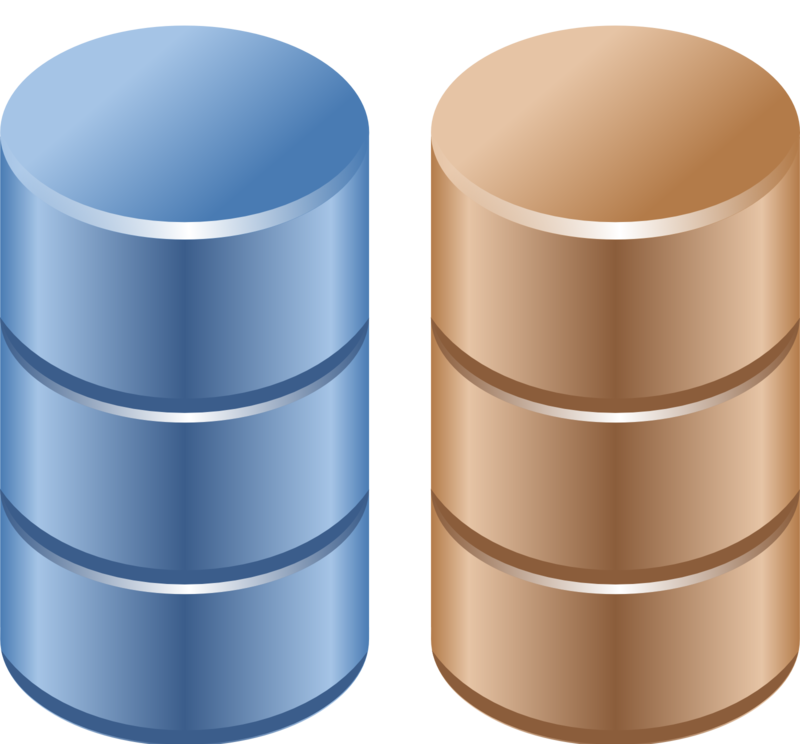 Old hard disks (and floppy disks) use cylinder-head-sector addressing to access a sector on the disk. Most current disks use LBA (Logical Block Addressing). A solid state drive or ssd is a block device without moving parts. It is comparable to flash memory. An ssd is more expensive than a hard disk, but it typically has a much faster access time. In this book we will use the following pictograms for spindle disks (in brown) and solid state disks (in blue). All ata drives on your system will start with /dev/hd followed by a unit letter. The master hdd on the first ata controller is /dev/hda, the slave is /dev/hdb. For the second controller, the names of the devices are /dev/hdc and /dev/hdd. It is possible to have only /dev/hda and /dev/hdd. The first one is a single ata hard disk, the second one is the cdrom (by default configured as slave). Below a sample of how scsi devices on a Linux can be named. Adding a scsi disk or raid controller with a lower scsi address will change the naming scheme (shifting the higher scsi addresses one letter further in the alphabet). A modern Linux system will use /dev/sd* for scsi and sata devices, and also for sd-cards, usb-sticks, (legacy) ATA/IDE devices and solid state drives. You can start by using /sbin/fdisk to find out what kind of disks are seen by the kernel. Below the result on old Debian desktop, with two ata-ide disks present. And here an example of sata and scsi disks on a server with CentOS. Remember that sata disks are also presented to you with the scsi /dev/sd* notation. Here is an overview of disks on a RHEL4u3 server with two real 72GB scsi disks. This server is attached to a NAS with four NAS disks of half a terabyte. On the NAS disks, four LVM (/dev/mdx) software RAID devices are configured. You can also use fdisk to obtain information about one specific hard disk device. Later we will use fdisk to do dangerous stuff like creating and deleting partitions. Kernel boot messages can be seen after boot with dmesg. Since hard disk devices are detected by the kernel during boot, you can also use dmesg to find information about disk devices. Here is another example of dmesg on a computer with a 200GB ata disk. paul@barry:~$ dmesg | grep -i "ata disk"
Third and last example of dmesg running on RHEL5.3. root@rhel53 ~# dmesg | grep -i "scsi disk"
The lshw tool will list hardware. With the right options lshw can show a lot of information about disks (and partitions). Redhat and CentOS do not have this tool (unless you add a repository). The lsscsi command provides a nice readable output of all scsi (and scsi emulated devices). This first screenshot shows lsscsi on a SPARC system. Below a screenshot of lsscsi on a QNAP NAS (which has four 750GB disks and boots from a usb stick). This screenshot shows the classic output of lsscsi. Another way to locate scsi (or sd) devices is via /proc/scsi/scsi. This screenshot is from a sparc computer with adaptec RAID5. Here we run cat /proc/scsi/scsi on the QNAP from above (with Debian Linux). Redhat and CentOS have this by default (if there are scsi devices present). Before selling your old hard disk on the internet, it may be a good idea to erase it. By simply repartitioning, or by using the Microsoft Windows format utility, or even after an mkfs command, some people will still be able to read most of the data on the disk. Although technically the /sbin/badblocks tool is meant to look for bad blocks, you can use it to completely erase all data from a disk. Since this is really writing to every sector of the disk, it can take a long time! The previous screenshot overwrites every sector of the disk four times. Erasing once with a tool like dd is enough to destroy all data. Warning, this screenshot shows how to permanently destroy all data on a block device. Tweaking of hard disk settings (dma, gap, ...) are not covered in this course. Several tools exists, hdparm and sdparm are two of them. hdparm can be used to display or set information and parameters about an ATA (or SATA) hard disk device. The -i and -I options will give you even more information about the physical properties of the device. Below hdparm info about a 200GB IDE disk. Here a screenshot of sdparm on Ubuntu 10.10. Use hdparm and sdparm with care. About this lab: To practice working with hard disks, you will need some hard disks. When there are no physical hard disk available, you can use virtual disks in vmware or VirtualBox. The teacher will help you in attaching a couple of ATA and/or SCSI disks to a virtual machine. The results of this lab can be used in the next three labs (partitions, file systems, mounting). It is adviced to attach three 1GB disks and three 2GB disks to the virtual machine. This will allow for some freedom in the practices of this chapter as well as the next chapters (raid, lvm, iSCSI). 1. Use dmesg to make a list of hard disk devices detected at boot-up. 2. Use fdisk to find the total size of all hard disk devices on your system. 3. Stop a virtual machine, add three virtual 1 gigabyte scsi hard disk devices and one virtual 400 megabyte ide hard disk device. If possible, also add another virtual 400 megabyte ide disk. 4. Use dmesg to verify that all the new disks are properly detected at boot-up. 5. Verify that you can see the disk devices in /dev. 6. Use fdisk (with grep and /dev/null) to display the total size of the new disks. 7. Use badblocks to completely erase one of the smaller hard disks. 9. If possible, install lsscsi, lshw and use them to list the disks. Looking for ATA disks: dmesg | grep -i "ata disk"
Looking for SCSI disks: dmesg | grep -i "scsi disk"
This exercise happens in the settings of vmware or VirtualBox. #Verify the device (/dev/sdc??) you want to erase before typing this.